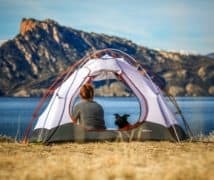 Coleman Montana 8-Person Tent Review: Should You Buy This? Don’t you think the time has come to get out of your lazy couch and nag your friends for a camp? The chi of camping definitely shoots up with the number of people you convince and add to join the escapade. The more mates you have for camping, the more stirring the journey gets. But the real fun begins only when you get to have all those people under a sole tent for a sandwich sleep. Exactly. So, it is high time to convince your friends to plan for a single tent thrill and think of owning this Montana 8-person tent from the brand Coleman. This tent tends to shelter up to eight people. Don’t think that the features end here. There are a lot of benefits that are enough to enchant you. 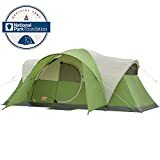 This Coleman Montana is basically a dome kind of tent with extended space. It involves a central part and the 2 main poles that build a structure copying the letter X. There are 2 extra poles are well where they help to extend the space. The tent cannot stand up on its own so you will need to stake the poor guy to the ground if you really wish to make it completely functional. And since the tent will be needing stakes, so you will also need to be very careful for picking a spot of camping accordingly. However, being a one-room tent, though it boasts to fit 3 queen sized airbeds for an 8-member group, but if you try it out in practical, it might not work. However, you can still manage to stuff about 2 airbeds and there will still be a lot of room to house your mate. The poles are all fiberglass so you might not find them enough great to be used for such a giant wigwam. However, the dome tends to compensate for that so you can still encourage yourself to buy this for its strength and durability. However, besides the 4 poles for the shelter, it will present you an extra pole as well so that you can use it for sunshade. And the 2 others have already been mentioned, thus in total, the tent owns 7 poles to stand. Along with the completely taped rainfly seams, the fly manages to cover both the doors and windows incorporating Velcro frame accessories. Besides, the tent has been made with polyester fabric and you can expect it to withstand any kind of disaster. There is although a WeatherTec system that helps to keep the moisture at bay but it still needed more improvement for proving its water-resistant feature. 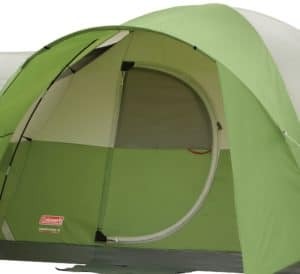 The best thing about this Coleman Montana 8-Person Tent is that it comes with hinged door that many campers desire to have. As mentioned earlier that the tent possesses 2 added poles that you can place in the door sleeves and with this, you can make the hinge work. But if you have 8 people for the tent, having a single door might not be a plus point for you. So you can call it the only downside that the feature has. 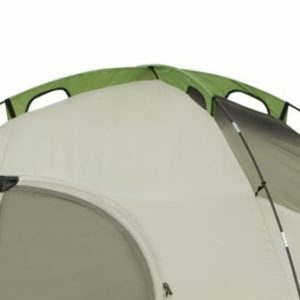 The tent has 3 windows where the 2 of them are inversed angle covered by the rainfly. Besides, you will find the top covered with mesh that helps in easy airflow. The other window is there on the door and if you want you can keep it open all the time. 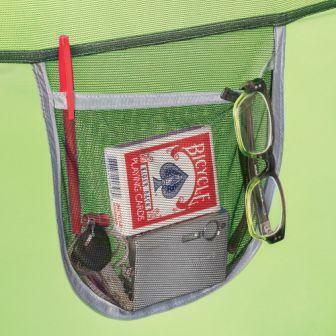 You will get 2 pockets attached on the wall but they are so small that you will find them pretty useless for an 8-person tent. If you are planning to go camping with 7 more people out there, then this would be a great choice to have. Although housing the suggested number of people could still be a bit questioning, but if you think you and your friends can adjust to get stuffed inside the tent, you can take this one into consideration. This is a one-room tent that can house about 8 people in the camp. And this could be one of the best benefits that could appeal you. Besides, its hinged door has made it pretty easier to get in and outside the tent just like the regular doors. Moreover, you can also take the benefit of the E-port that offers electrical power inside the tent. And not only that, you will also get an extended bag to carry for easy portability. And the benefit does not end here, the front sun shade is another bonus feature that tends to be more appealing to have. You will find many reviews and ratings of the product. As for its value, it definitely is worth the price. For a giant tent like this, the brand is offering a much affordable price tag so that all the people can afford it. The tent is spacious enough to house a group of 8 people. Presence of hinged door makes it great for easy access. E-port for electrical power inside the tent so that you don’t lose network. The tent is quite durable and solid. The rainfly is pretty big for a good shade. 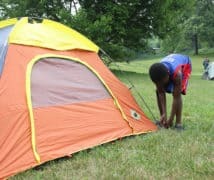 It takes about only 15 minutes to set up the tent. One door might not be a good decision for a giant tent. The fiberglass poles can be disappointing. There is no vent close to the floor. The tent might not perform well to show its water-resistant feature. Provides great ventilation! I had a small fan inside the tent for circulating airflow and I found it nice and cool. The zipper tends to get stuck sometimes. It has a lot of room to house a couple of people. Spacious and easy to set up but the Velcro is useless. There is a hidden zip for electrical cords and it is great. The only downside is that there are no options for dividing the room. Wish to have more doors for easy access, but still, the tent is great. Tent is one of the most vital parts of camping. 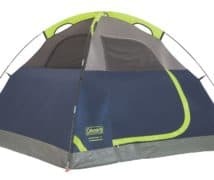 And if you are one of those whose mates have given all the responsibilities to look out for a giant tent to go camping, then I would absolutely suggest you to have this Coleman Montana 8-Person Tent. I don’t think I will be needing to highlight the benefits of the product anymore as I have done it in one of the sections. 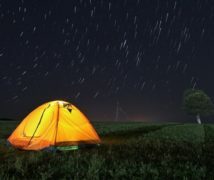 Although there are few drawbacks that you must keep in mind before grabbing the tent, but that does not stop it to be the best tent to have. 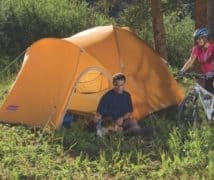 We hope you have found this Coleman Montana 8-Person Tent Review helpful. We have tried to bring all the details about this product.